What’s new in Vista’s System Icon? Three of the tabs in Vista’s System Icon are the same as XP; the exception is System Protection, which replaces System Restore in XP. My screen shot opposite is a thumbnail, and thus System Properties enlarges if you double click. System Protection combines Shadow Copy with Restore Points. Shadow Copy has been described as: ‘do it yourself’ backup. It saves system administrator’s from having to restore a user’s files from backup, while it empowers users to retrieve their own previous copies of files. 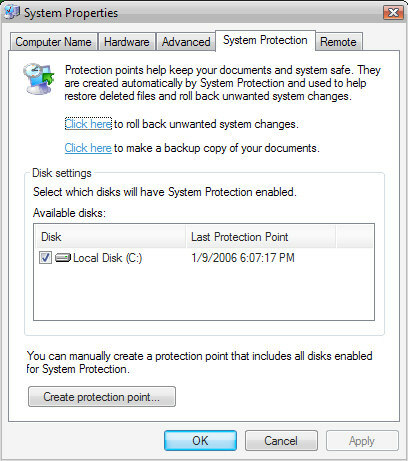 Protection Point in Vista, like Restore Point in XP, helps you to retrieve problems caused by updating drivers, and finding that the newer version does not work as well as the previous driver. To find the System Protection tab, press the Windows Key and Pause / Break, the System Icon should launch, and from there, click on the third tab – System Protection. While there is nothing new under the Remote tab, this is a handy place to choose who can connect to your Vista machine. Incidentally, I found that when testing Vista on Virtual PC, making a remote connection from my own host machine to the Vista guest, gave me full screen and other benefits of convenience. Talking of hidden agenda, I try and go with the flow and learn the new menus inside the Control Panel. Tempted thought I am, I resist reverting to the Classic View. Employing this strategy, I had a good tour around the Control Panel, but it took me three circuits before I found the System Icon, which was hiding under the Performance and Maintenance icon.